Stream anime episodes online for free, Watch One piece Episode 74 English version online and free episodes. Anime Episode guide One piece Episode 74 English dubbed The Devilish Candle! Tears of Regret and Tears of Anger! After explosively beating down on the still trapped Luffy, Mr. 5 and his partner take Vivi to the giants’ duel site, where Mr. 3 is busy further restraining Broggy with his wax. 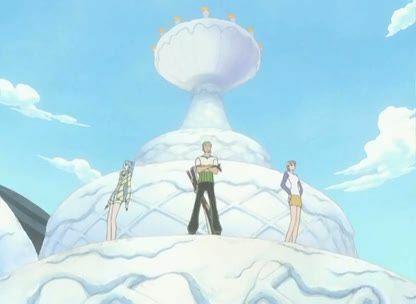 After that, Mr. 3 creates a large, cake-shaped pedestal upon which Vivi, Nami, and Zoro are placed. On top of the pedestal, he creates a rotating platform upon which he places several large candles, which spray wax over his prisoners, slowly turning them into wax figures.